Did you know that there are ways to ripen your cheese depending on the type of cheese you make? During this episode I cover the four main ripening process classifications and describe them in detail. Cheese news centres on the global oversupply of dairy products and the Cricketer Farm in the UK. If you liked the show then pop over to iTunes to give it a rating and review. I would be honoured to read your feedback. LIKE WHAT YOU'VE READ OR HEARD? If so, please join thousands of others who receive regular home cheese making tips, videos, podcast episodes, and recipes. All for free! 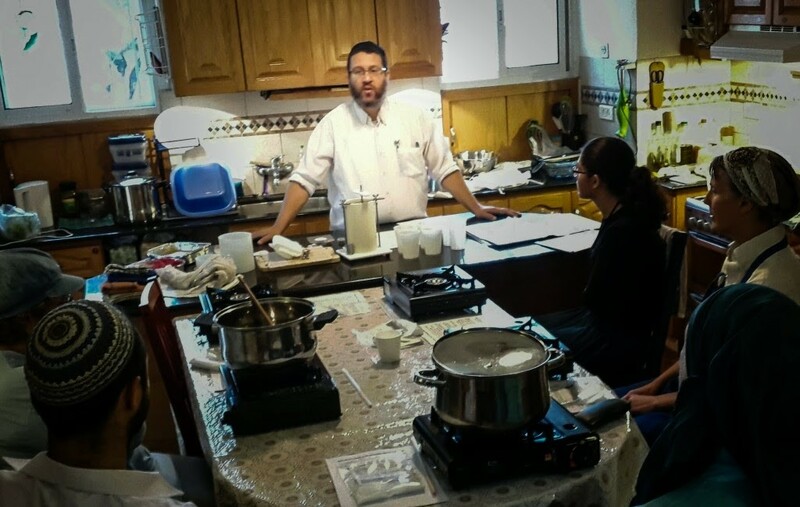 Today we learn about Kosher cheese from Dovid Wheeler in Israel. I first started corresponding with Dovid about a year or so ago, and he sent through the Tzafatit recipe that I posted back in January this year. During the episode, Dovid describes the cheeses that he makes at home, successes, challenges, and some issues that he has had with the milk that he sources. If you want more information about Kosher cheese making, the great news is that Dovid blogs over at Koshercurds.com where you can find a wealth of information on the topic. Also, a big shout out to Sami for the kind words of thanks and encouragement at the end of the episode. So curd nerds, if you think you have a cheese making story to tell, drop me an email. I would love to have you on the show as my next guest. If you wish to receive the show on your portable apple device each time I release an episode, you can subscribe via iTunes. You can also subscribe via Stitcher radio below for android devices. So, until next time curd nerds, remember to Keep Calm and Make Cheese! Well curd nerds, I cracked the code. After watching a few YouTube videos, and with a bit of improvisation, I have created, what I believe to be, an authentic Halloumi / Helim cheese. This post shows you the steps to take on how to make Halloumi! Now I have often said during the podcast that the home cheese maker will always get the best results when using the best milk that one can afford. So, I really lashed out, opened the wallet and forked out for some of the best packaged milk I could buy around here. In the picture below, there are two types. The green cap is a pasteurised non-homogenised milk, and the orange cap bottles are extra special and are unpasteurised non-homogenised milk or better known as real fresh milk that was bottled one day ago! It is sold as cosmetic skin milk (or some such description), because it is not legal to be sold for consumption. Consequently, this milk set the best curd I have ever experienced, and therefore made the best cheese possible. I really didn’t want my experiment to stuff up, just because I was stingy with the quality of the milk. Here is my finished product. Out of 8 litres (just over 2 gallons) of milk, I made nine decent sized cheeses. Yes there are only seven in the photo above, but there are two in the frying pan below! Now if you are a bit worried that I used some raw milk, don’t be. The process of making Halloumi requires that you cook the cheese after pressing at around 97°C (206°F) for around an hour. Certainly long enough to kill any harmful bacteria, whilst still preserving the delicious raw milk flavours. I must say that this cheese worked well, and was quite easy to make. From milk to finished product it took me about four and a half hours to make, which is very respectable for an intermediate difficulty cheese. I don’t know if I would class this as a beginners cheese, however, now that you have a video to go by, why not have a go at making Halloumi yourself? Heat milk to 32C (90F) and then add the rennet solution. Turn off heat. Stir well, cover, and allow the milk to set for 40 minutes. Upon a clean break, cut the curd into 12 mm (half inch) cubes and let rest for 5 minutes. Stir gently and slowly heat milk to 40C (104F) over the period of 20 minutes. Allow curds to rest for 10 minutes to form a solid mass. Place a second stockpot under your cheesecloth lined colander and drain the whey and strain the curds for three minutes. Removed the curds in the cheesecloth and place on a large wooden (or food safe plastic) board, and fold the cheesecloth so that the curd is square-shaped and the curd will not escape when pressed. Place a second board on top and then add 4 kg of weight to press. I used two 2 litre milk cartons filled with water as the weight. Press for 10 minutes, then remove weight and top board and flip over curd mass. Re-press for 20 minutes. Whilst waiting for the second pressing, return the whey back to the stove and heat to 90C. You will notice that excess curd will float to the top, so scoop off most of this froth to clear the whey. Continue to heat the whey to 97C. Don’t let the whey boil. Remove the weights and top board from the curds, then remove the cheesecloth carefully. Place the pancake like curd onto the bottom board and cut into 100 x 150 mm rectangles, and then place into the hot whey. They will sink to the bottom. After about 45 minutes, the cheese will float to the top. Allow the pieces to remain in the whey for another 15 minutes after floating. Remove cheese pieces from the whey one at a time (you may want to wear rubber gloves as the cheese may scald your hands), and coat in a cheese salt/mint leaf just like you would if you were crumbing or battering a piece of fish fillet. Whilst the cheese is still hot, fold the piece in half to increase its height. Allow cheese to drain for an hour, then either place in airtight container into the fridge and consume within a week. Allow 24 hours before using so that the salt permeates through cheese. Another method of storage is to vacuum pack for up to six months in the fridge (not that it will last that long, it is too yummy). This cheese does not melt when heated, so it is perfect for frying. It tastes delicious when prepared in this style. Great for barbeques on hot summer days with a lovely green salad. The mint really complements this cheese. Well I hope you have enjoyed this video tutorial and recipe creation. I am so pleased with the final outcome, and my family cannot get enough of this cheese. I dare say it will be all consumed within a week! So that’s how to make Halloumi! Who is going to give this cheese a try? Go on. You know you want to!